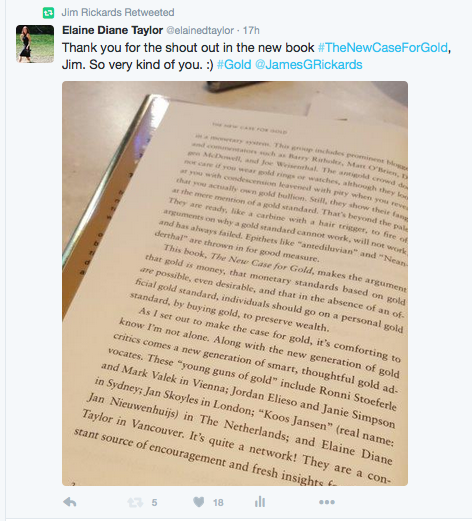 An interview synopsis of Jim Rickards, New York Times bestselling author of The New Case for Gold, The Death of Money, Currency Wars and The Road to Ruin, with Alex Stanczyk from The Gold Chronicles June 2018 vidcast. Jim recommends the free report “In Gold We Trust”. Gold has been moving geographically from west to east. A lot of the physical gold has been moving out of vaults in places like England, including the Bank of England, and moving east to Switzerland, where it’s re-refined from 400 ounce bars into shiny new 99.99% pure 1 kilo gold bars. From there it’s off to China and other countries. There’s a “New Axis of Gold” – a set of countries who are looking for a way out of the current U.S. dollar payment system. There is a small list of people who are the power elites that know the most about the world financial system. Jim just returned from a speaking engagement in Hong Kong where he was on a panel with one of those elites, former IMF head John Lipsky. Jim spent an hour alone one-on-one with John. Russia has been buying gold consistently like clockwork. The amounts differ each month but it’s never zero. In late 2014 the price of oil collapsed. It bottomed in 2016, going from $100 per barrel to about $22 per barrel. It’s back up since then, and is now about $60. Russia is dependent on oil for income, and even though the price collapsed they still needed to keep their financial obligations. They needed the U.S. dollars that oil sales brought. The Russian companies would be paid in rubles but they’d go to the Central Bank to exchange those for U.S. dollars to pay their debts. Russian reserves of U.S. dollars went from about $500 billion down to $300 billion in about 1 1/2 years – a 40% decline. Even then they never stopped buying gold. Russia made it a national priority to buy physical gold even in distress. China also hasn’t stopped buying gold. While Russia is transparent and you can see their gold holdings on their website, China is not transparent in the amount they hold. We know Iran has smuggled gold in from Turkey and Dubai. Turkey has been receiving gold from Switzerland, where it arrives on a plane and is then switched to another plane, which then flies off to Tehran. From 1999 to 2010 Central Banks were net sellers of gold. In 2010 they flipped to being net buyers. The last time the U.S. sold any significant gold was 1980. After 1980 the big sellers were Switzerland, the U.K. and the IMF. Germany, Italy and France didn’t sell anything significant. Now there are virtually no central banks selling and at least ten buying. Gold mining has flat-lined and gold is now harder to find. The central bank buying has been strategic. Today the U.S. dollar is 60% of global reserves, 80% of global payments, and over 90% of oil payments. The U.S. dollar is King. Ben Bernanke and John Lipsky believe it will always be the king and they’re not worried according to the private conversations with Jim. The U.S. is using their dollar advantage geo-politically. They’re using sanctions against other nations who are tired of it. The other nations are working towards creating an alternate payment system for international trade. They could create a permissioned encrypted distributed ledger, a blockchain that’s by invite only, run by Russia or China, where they only let those in that they want in. They would set it up where 1 unit is equal to a certain amount of gold. They could then ship goods and services back and forth with payments done between the participating companies on the blockchain ledger, and then the net owing settled up every month or so with a shipment of physical gold. There would be no need to use the U.S. dollar. Jim sees this system evolving. The pieces are being put in place right now. Institution allocations to physical gold are so low, 1 1/2 – 2% on average and most being zero, that any increase is a big deal for the demand for physical gold. Paper gold contracts do not satisfy the desires that most people have when they purchase gold. They want the gold as an insurance against catastrophe. When there’s a financial panic like 2008, or worse, which many see coming, then you want to hedge your losses with the rise in the price of gold during times of crisis. The other reason they want gold is so they have their asset liquid and available when a crisis happens and banks make availability to your own money difficult in the turmoil. In both of those cases paper gold contracts will not provide for you. A company can cancel your contract and give you the money from the day before’s closing day. Even if you wanted to keep the contract while the price of gold is rising every hour and every day. They have the right to cancel it and give you a cash out. Also, if you wait until a crisis to buy physical gold then you will not be able to buy it at any price because it will all be spoken for. There will be a shortage. You want physical gold and not a gold contract based on the price of gold. Do not hold it in a bank. Keep it in non-bank storage. There is no proactive work going on right now in the U.S. to create a new monetary system like Bretton Woods. But Russia, China, Iran, Turkey and others are being proactive. Whether the western elites have to come up with something quickly that’s backed by physical gold to try to restore confidence in a panic, or else the eastern elites create a new system backed by gold, all roads point to gold. Gold is at $1,295.30 U.S. per ounce. And now, last weekend, the very promenade I was standing on and reflecting on her was named in her honour. So very glad to see this. This is part of Canadian culture and world musical culture. Brilliant lyrics and lovely chord structures. A snapshot of the world at that time. I’m currently in Kelowna, British Columbia close to the Gold Rush Trail. Working away. My first private music night is this week with musicians here. My favourite night at a house party was in Lillooet, B.C., where I met flutist Matt Eakle who plays with Jerry Garcia and the David Grisman Quintet. He was in town to visit family. A brilliant and sensitive player. Loved him. The living room was packed with musicians. A magic night. He asked if I would sing a Joni cover. I said I don’t cover Joni because it would be like covering God, but I wrote a song that includes her if he would like to hear that. He was crying by the end of it. A bit emotional which is what music is all about. It was the song “Six Feet”. About loneliness and how we dig up our own story lines and our own graves. How we have to face dirt in order to find what is underneath, to leave it behind and live lightly. This part’s hard. This part’s lonely. But we’re all digging on our own. I’m just listening to Bob Dylan. Listening to Joni. – from “Six Feet” available on iTunes. The packaging for the Wild Gold pendant is nearing completion. I designed it using Fibonacci ratios, recycled ethically sourced paper, linen, my own handmade paper and with great love. I’ve put such care and time into this product. Made by my hand. I care about the gold, ethically sourced, unrefined and beautiful right from the rivers of the Canadian Gold Rush Trail. I care about the miners, artisan, ethically paid, and the beautiful environment it all happens in. And I care about the symbolism and science of gold. Enduring value. Precious. Beautiful.